So a friend (hello Maggie!) commented that I haven’t been blogging about food very much lately. It’s true. To rectify the situation, here’s a quick little entry for a black bean soup recipe I tried recently. Let me just say that I don’t really like black beans. I find them kind of boring. And they give me heartburns. BUT! This recipe is actually quite good. So if you aren’t a black bean fan, I would recommend trying this one. It’s a tasty and hearty soup, and as a bonus, it’s very easy to put together. Throw a nice chunk of bread on the side, you’ve got yourself a week night dinner. Oh, don’t skip the green onions, cilantro, and feta cheese (unless you don’t like them). They really make the dish. This recipe came from…you guessed it, Epicurious. Heat oil in heavy large pot over medium-high heat. Add onion, carrot, and garlic; sauté until vegetables begin to soften, about 6 minutes. Mix in cumin and 1 teaspoon jalapeño. Add beans, tomatoes with juice, and broth; bring soup to boil. Reduce heat to medium, cover, and cook until carrots are tender, about 15 minutes. Transfer 3 cups of soup to blender and puree until smooth. Return puree to pot. Simmer soup until slightly thickened, about 15 minutes. Season to taste with salt, pepper, and remaining 1 teaspoon jalapeño, if desired. Ladle soup into bowls. Pass cilantro, green onions, and feta cheese separately. 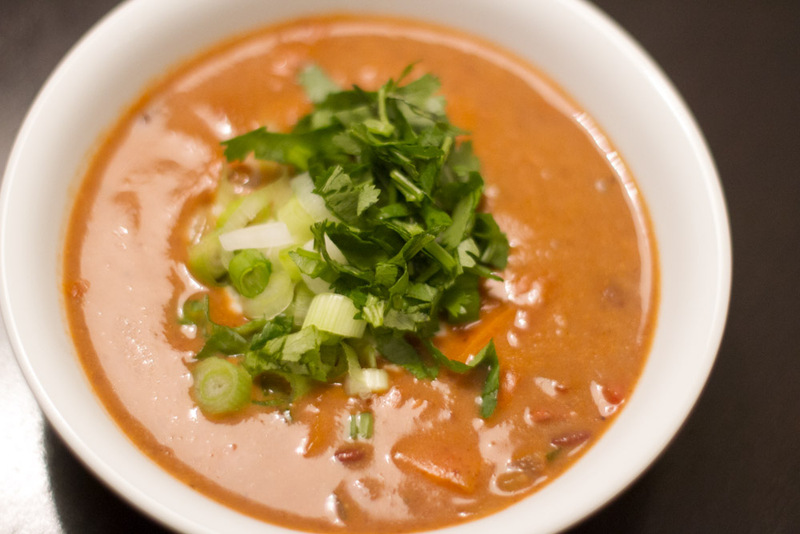 This entry was posted in Cooking and tagged black bean soup, cooking, recipe by angelasaito. Bookmark the permalink.